Robert Fuest's barnstormingly elegant horror flick from 1971 has often been highly regarded by fans of early 1970s British Gothic cinema. The tale of a hideously deformed surgeon searching out and killing the doctors that operated on his wife with visitations of Biblical plagues is best remembered for a mesmerising performance from Vincent Price, lavish period design and, for our purposes, the enchanting, ethereal and melancholic music of Basil Kirchin. Basil was held in great esteem by jazz musicians and their immediate circle. He was a talented drummer and composer who worked in his father's band which went onto record with Decca and Parlophone with producer George Martin. The band toured the country, accompanying signers like Sarah Vaughan and Billy Eckstine. Basil took over the band, after his father was involved in a car crash, and played regular residencies in Edinburgh and in Manchester. When the big band sound dwindled away in the mid-1950s, Basil went on his travels to India and Australia. In 1961, he began to write music for films, including The Shuttered Room (1967), The Strange Affair (1968), I Start Counting (1969), The Abominable Dr Phibes (1971) and The Mutations (1973). Whilst the films might now be considered B movie material, he did have a certain freedom to do what he wanted and he harnessed the talents of some of London's most inspiring jazz artists like Tubby Hayes, Alan Branscombe and Kenny Wheeler. He even worked with Led Zepp's Jimmy Page when he was contributing library music to the De Wolfe catalogue. Albums like the gorgeous Abstractions Of The Industrial North have a minimalist, jazz feel, are quite freewheeling and often experimental in nature. Kirchin later went on to experiment more and more with 'found' sounds, manipulating sounds and music in an improvisational style. 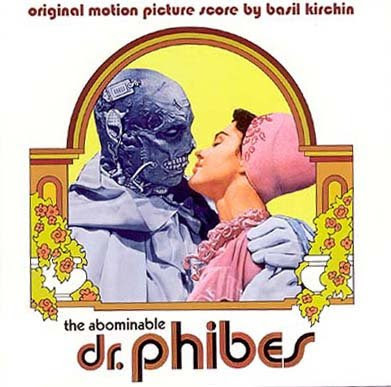 On the Perseverance CD release, now alas more or less out of print, the music for The Abominable Dr. Phibes is a lush, melodic suite of variations on the themes Kirchin composed for the lead character and his female companion Vulnavia. Both themes are reinterpreted throughout with the motif for Phibes emerging on "Phibes Waltz/Cage Full of Bats" and the melody for Vulnavia first heard on "Phibes Visits Dr. Longstreet/The Curse of Blood/Injection" and "Vulnavia." The waltz and theme for Phibes are stirring, jazz fanfares that reek of 1920s big band opulence, vast dance halls and long dead, lost times. They descend into some disturbing bass plucking to suggest a lurking dread under the artifice. There are some very short cues, in poor quality, sourced from the film print itself that are dotted amongst the soaring strings, flaring brass and sweeping melodies on the Perseverence CD but the majority of the mono recordings are in good nick if sounding a bit confined in the mix. It's gloriously camp and bonechillingly eerie at the same time and beneath the fusty big band sounds there are abstract and atonal notes that give the compositions an edge. The experimental can largely be found the in the 11 minute long "Music Suite" which contains some music that is in the film and some that isn't. I believe that all the Kirchin compositions were meant to be heard as a suite and the way the tracks are split does give the album a sort of start-stop quality. A shame, as the music is as decadent as the blackly comic film needs it to be and it has a strange fin de siecle aura about it.